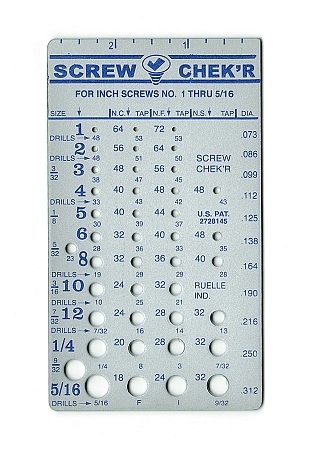 Inch Screw Checker: #1 - 5/16"
Screw Checker: Inch System - #1 through 5/16"
The Inch Screw Checker is a precision threaded tool for complete instant identification of Inch Screws. This quality tool made of heavy-gauge steel is satin-chrome plated, expertly machined and American made! This tool will check screw sizes ranging from #1 through 5/16" in the UNC, UNF, and UNS pitches. It will identify diameter, pitch, length, tap series and drill size. Not only will it identify machine screws and bolts, but also wood screws, sheet metal screws, self-tapping screws, standard size rivets, and common cotter pin sizes. As an added benefit, this tool can be used to straighten bent screws and clean up dirty or rusty threads. Measures approximately 3" x 5" and 3/32" thick. Want your company name or logo on the Screw Checker? These unique tools also make excellent promotional items! Give them away to your best customers, take them to trade shows and hand them out to serious prospects. Forget personalized pens, mugs, and key chains...give them something they will use and tell their friends about! If you really want to make an impression, get the Screw Checker personalized with your company logo today! Made 1 of these years ago to size and cut screws for custom WT Models. This works perfect for gunsmithing and optic mounting work. Excellent quality, very satisfied with product. will recommend your company to all who need them. I remember these chekrs from years ago. At the time they looked to me to be too flimsy to be very useful. I stand corrected. Now that I have them I wish I had bought them then. Totally satisfied with this product. EXCELLENT quality for price! I find myself not only using it to categorize "loose" fasteners, but to confirm drill bit sizes for pass-through and anchor pieces. Glad I found these folks!! The quality of this tool was better than I expected. The low price with free shipping made this an unbeatable buy! So glad I found you guys.